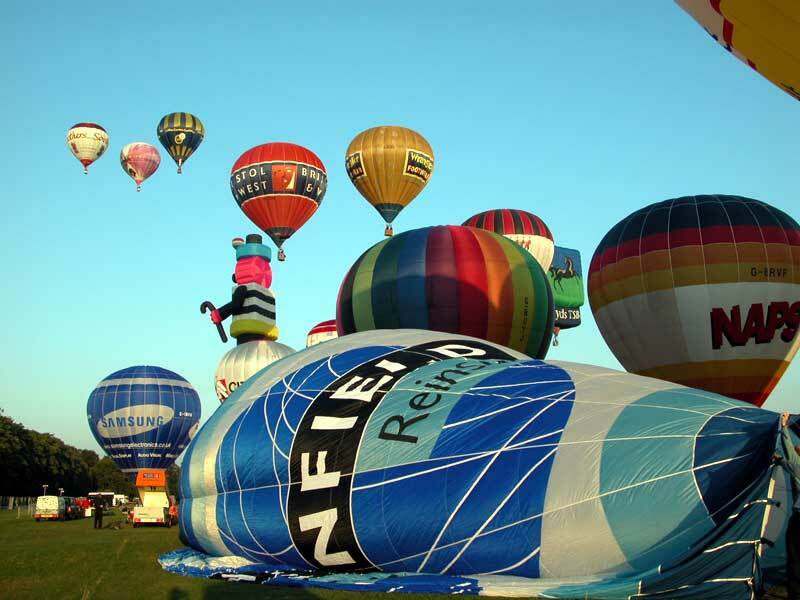 The annual Northampton hot-air balloon fiesta has changed over the last 13 years and although this year there were fewer special shapes the atmosphere was even more relaxed and friendly than usual. 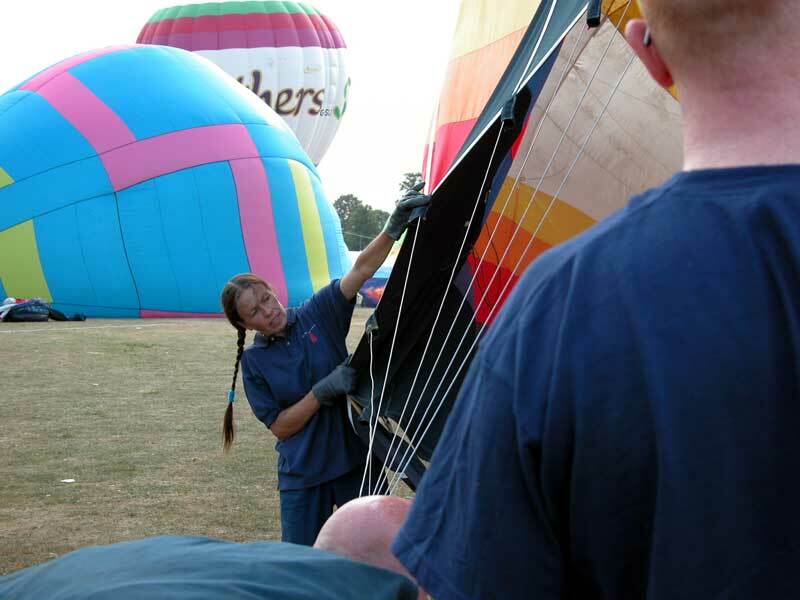 There were 70 balloons registered and 63 flew on the Friday evening. The weather forecast looked promising for the whole weekend but unfortunately the Saturday evening easterly winds refused to settle down and so the flight was cancelled. Steve flew Friday evening, Saturday and Sunday morning. The Friday flight was quite gentle but the air was a little unstable and Steve landed at 7 knots. Friday morning is traditionally the crew flight and as you can see from the photo taken after packing away everyone was in high spirits. Steve did the retrieve on his own so that Jane could fly and he was at the edge of the field as the basket touched down on the stubble field. After finding the friendly farmer - Jane got him out of the shower so she had the added thrill of meeting a young farmer with just a towel wrapped around his lower half. No time to waste because we had to get back to refuel the balloon and have breakfast. 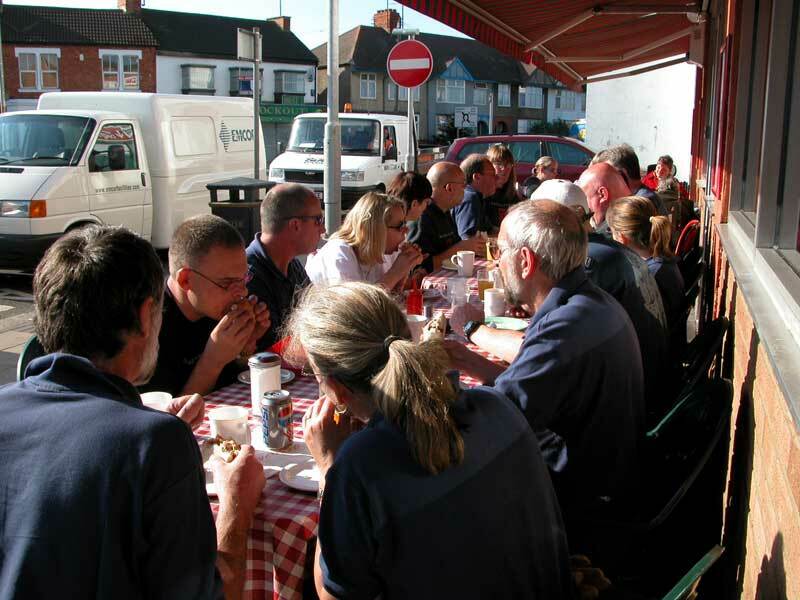 Breakfast at the Super Sausage on St Leonard's Road is another tradition and Alison had cheekily phoned ahead and booked a table. Although it has a reputation as a greasy spoon this is unfounded. The large mugs of tea and coffee are excellent - they will even make a weak tea to suit our needs although asking for Earl Grey would be pushing the limits of customer service too far. Tony generously bought us all breakfast and there was a mixture of full fry-ups, sausage baps and bacon sandwiches being consumed. The conversation was light-hearted and this was just the beginning. The thinking was that even if we didn't fly again it was already an excellent weekend. Steve was not due to fly on Sunday morning but because the Saturday evening slot was cancelled, the passengers were willing to turn up at 06:00 for a flight the next morning. 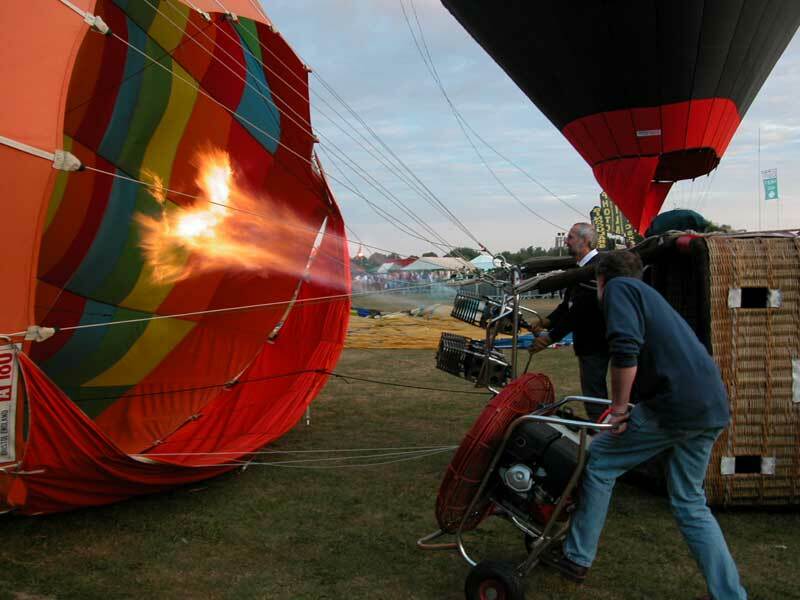 Nick is busy on the fan making sure the balloon is fully cold inflated while Steve blasts hot air into it. 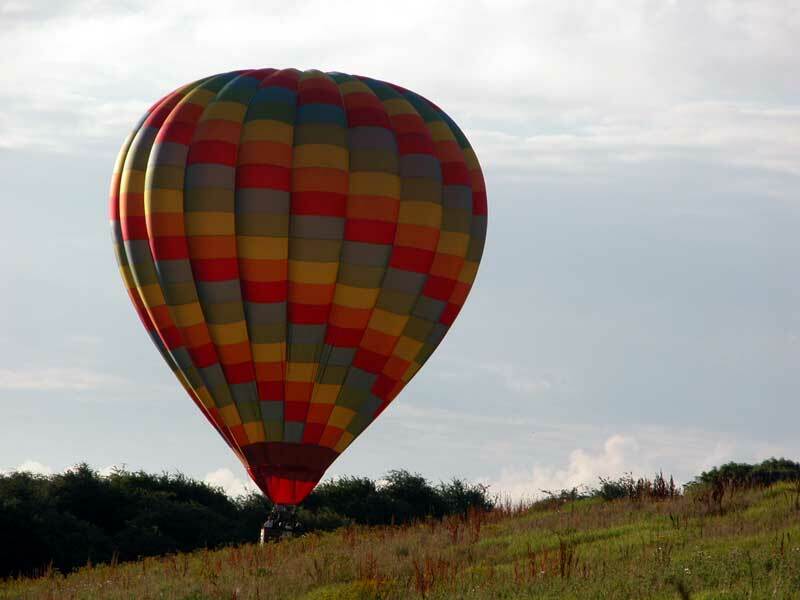 With gentle morning winds the inflation was straightforward. The passengers were more nervous than usual and the first ten minutes of the flight was full of funny remarks about how frightened they were about being so high. At the end of a fast flight having travelled rapidly close by Harpole, Weedon and Daventry, Steve landed in some set aside on an uphill slope. Moments before the touch down he had been travelling along at 15 knots but he had selected a landing site that was in the shelter of some trees and in a steep sided valley so that the wind had reduced sufficiently to make a stand-up landing. The passengers were overjoyed with the whole experience and several of them were ready to do it all again. 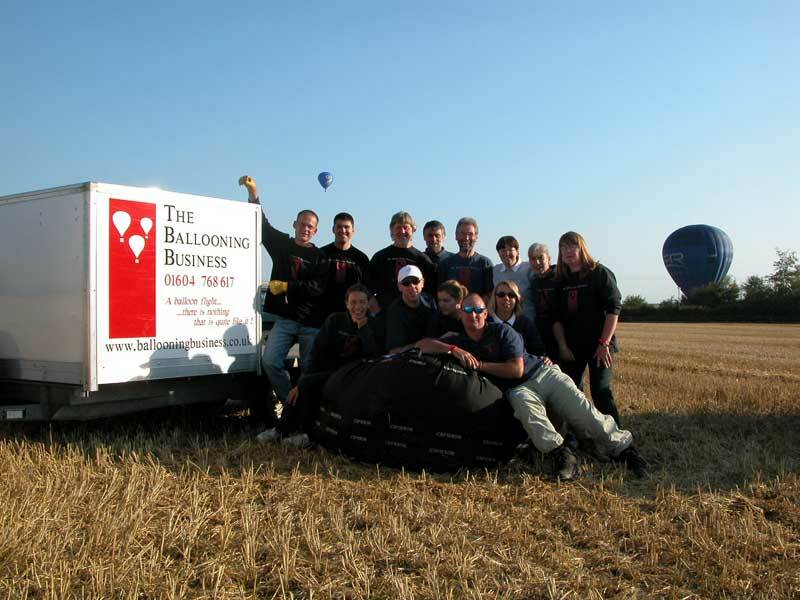 The balloons taking off from the launch site are like bubbles of air being released from a punctured tyre. Although there were only a few special shapes the various colours of the balloons is still a beautiful spectacle and never ceases to enthral us both. Jane can be seen here throwing herself into the role of opening the balloon mouth open. Glyn was the pilot for the flight and you can just see the top of his head as he inflates the balloon. Alan has his back to the picture and is in control of the fan. 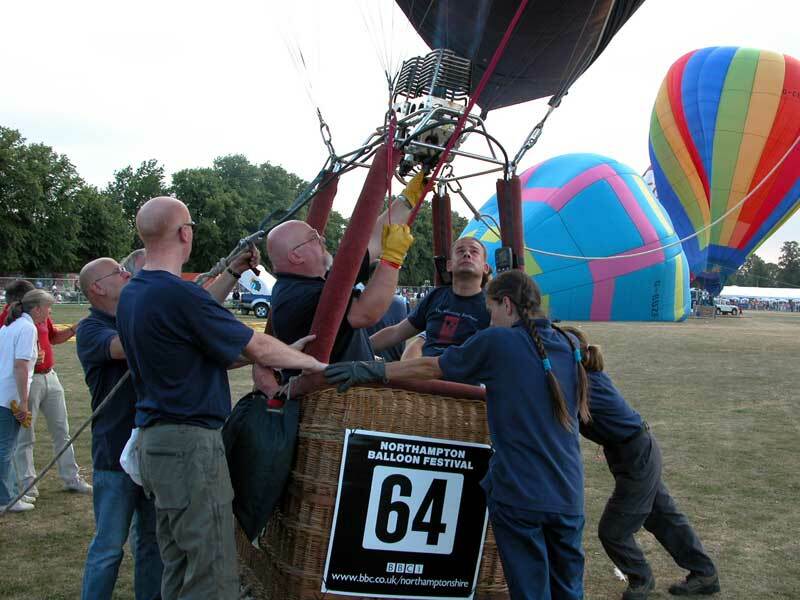 With Glyn in control NAPS balloon stands up and he goes through his pre-flight checks. This was the Sunday evening and it would be the last flight of the weekend. A number of balloon crews have already gone home and so there was more space on the launch field to layout.